Before we had kids, my husband and I discussed our parenting philosophies. When the subject of Santa Claus came up, my husband said he didn’t feel a need to lie to his children. I laughed, and then realized he was serious. I said NOT participating in the Santa thing would not work—our relatives will want to do the Christmas Eve Santa thing and they will do it in Elementary school and when you watch T.V. 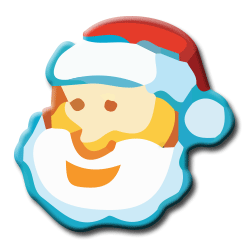 in December it will be all about Santa Claus. I said all the other kids’ parents would be mad at us because our kids would ruin it for everyone else. I mentioned that my parents got REALLY into the Santa thing on Christmas Eve, even making hoof prints and sleigh tracks in the snow outside our house. I laughed and said, “They were so convincing, I was twelve years old before I stopped believing in Santa”. And then came the inevitable feeling that always came with that memory: shame for being so gullible, and a feeling of betrayal. I know my parents enjoyed giving me that sense of wonder and excitement, but I’m certain my very active imagination would have come along just as nicely without that lie. This initial conversation about Santa Claus spurred further discussions. If Santa Claus was out of the question, so were the Tooth Fairy and the Easter Bunny. And through it all, the point was the same: trust must be earned, and if we lie to our kids about this stuff, how could they trust us when it comes to really important matters? If we want respect from our kids, we should respect them as well. After our first child was born, we began working our philosophy into conversations with our families. We didn’t want to have Grandma talking about Santa only for us to explain again the real point of Santa is about giving and opening yourself to new possibilities and enjoying the wonder of things around you. If we weren’t going to lie to her, it didn’t make sense for our families to lie to her. When she became old enough to start talking to other kids, we explained to her that other kids believed in Santa Claus and these other stories and that it was important not to ruin it for them—it is important to respect other people’s beliefs. I thought this would be the hardest part, but our child was very conscientious and kind. She has come home from school and told us about how she dealt with different situations and comes up with good ideas to deal with sticky situations. Most times it seems she doesn’t even need to say a thing. Now she has reached the age when kids start learning the truth, so it turned out much easier than I expected. I believe some of our family members had a harder time with our decision than others. One Christmas, when my daughter was five, I overheard an aunt telling her the story about Santa delivering gifts to everyone in the world on Christmas Eve. When I saw my daughter later, I asked her about it. I hesitantly said, “You know, that is just a story, right?” She said, “Yes, it’s an interesting story. But I know it’s not true”. My five year old handled the situation with aplomb. I am still proud of her. I think the hardest part was when my daughter got “reindeer food” at school last year, and she came home and told us that if you sprinkle it on the lawn outside, then the reindeer will eat it. I was confused about her excitement and reminded her that it wasn’t real. Then it dawned on me: my child loves animals. She really, really wanted to see a reindeer on our front lawn. She’s right; it would have been pretty cool. But I don’t think they would have appreciated a tablespoon of oats, glitter, and sugar.